I would like to bring you up to date with a media release that North Melbourne Football Club posted late yesterday (9 May) that detailed their vision of their place within the Arden Street Precinct. We didn’t have any prior knowledge of the plan nor the specifics of it, as they had not previously consulted us. This is quite normal in circumstances like this as the NMFC proposal was submitted to the VPA (Victorian Planning Authority) back in late 2016 after the VPA called for submissions on the way the Arden Precinct should be developed over the next 40 years. I met with the CEO of NMFC, Carl Dilena, this morning, to discuss the situation, to understand his views.. That conversation was very constructive and it identified to me that the NMFC Vision was just that; a very broad vision for one of the many possible futures for the NMFC in the Arden Precinct. Many other organisations will have submitted their own visions for the area, and the VPA will put out a further draft guide or plan for the Arden Precinct later this year. 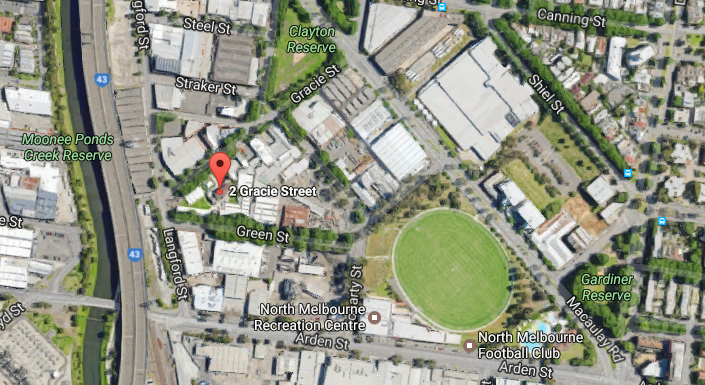 The NMFC proposal sees the Club acquiring land all the way from Arden Street up to and including #2 Gracie Street. Their Vision is available for viewing on the NMFC website. It is very clear from my discussions with Carl this morning, that NMFC see this as a “broad vision” as to what they would like to see happen over the next few decades. They are well aware of the number of businesses and organisations and community groups that would have to all come together to make their Vision, or any version of it, a reality. The NMFC Vision requires a great deal of public money (it would have to be funded by Government and Council) and there are many years to go, before something such as this concept plan, could even begin to be realised. Regardless, the Home has no intention of leaving Gracie Street. Our links to the site, to the community, and to the social fabric of Melbourne, are far too strong and important – both for today and the future. I therefore want to assure all our supporters and staff, that the Home, with 107 years of history in the North Melbourne Community, will continue to have a permanent place here that services the needs of North Melbourne and the Greater Melbourne and Victorian Communities. These are needs that we and the Government know very well; they are urgent, and they remain at critical levels. These needs include a much greater focus by all levels of Government, on new animal welfare legislation, and new services, to protect and enhance the lives of our voiceless companions – and it would definitely require much higher levels of funding by all levels of Government to achieve – this would have to form a major part of any discussions held between the Home and any organisation interested in our presence in the North Melbourne and broader community. The NMFC proposal is an ambitious aspiration. It is also aimed at driving Government engagement in the future of the club within the new precinct of Arden. NMFC is an elite AFL club and as such you would expect nothing less. In our own way, we must also be recognised as an elite animal welfare organisation with a Vision and Mission of our own. The Home is funded by you – generous, kind, caring and compassionate members of the public, who have a passion for the welfare of our voiceless friends. The services we provide to government, to councils and to the community are extremely valuable. They will remain a vital part of the community need and expectation – for as long as they are needed. The new Arden precinct will be developed in stages over the next 40 or more years. It is therefore unlikely that this plan would be adopted as it currently looks. The VPA itself has previously published work that shows a different look and feel for the area too. For all of these reasons I would ask that we share this view with anyone who asks, and reassure them that their donations, their legacies and their compassion, and their commitment to our faithful friends in need, remain as vital to our Mission as ever – even more so as we travel through the next 10 years or so.